The Biomat King is perfect for a shared healing space at home. It allows enough space for two people to relax receive the deep warmth of the Biomat far infrared and negative ion treatment. It's the perfect size for a king size bed or any flat surface at least 71" wide and 79" long. Its surface is covered in amethyst and tourmaline crystals. A Biomat King is an investment in an FDA Registered, and ISO Certified, medical device. Far infrared energy is invisible light which occurs just to the right of red on the rainbow spectrum of light. Far infrared energy deeply penetrates bodily tissues to provide deep radiant heat therapy. Far infrared has been used for healing and protecting the human body since our beginnings. Long before the current scientific evidence emerged about the benefits of far infrared energy people used it in the form of sunlight or hot stone therapy to preserve their health and heal minor injuries and illness. Biomat Mini brings centuries of healing knowledge into the modern world. The Biomat King ships with a dual control panel for individual comfort, travel bag, and 100% cotton quilted pad. The 100% cotton pad is designed by the makers of Biomat to improve the experience and effectiveness of Biomat by reducing the experience of heat on skin contact without reducing the benefits of far infrared or negative ion generation. The Biomat should always be used with one of its 100% cotton pads. Order an Extra Biomat Cotton Pad here. Insert Quantum energy pad image here. Some people will prefer the added comfort of a Quantum Energy Pad atop the Biomat King during sleep. The Quantum Energy Pad will provide a soft padding above the Biomat for people who prefer a softer surface. 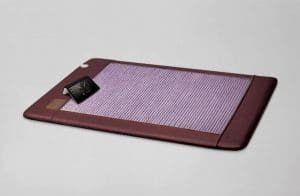 If you plan to use Biomat specifically for sleep please check out the Orgone Biomat™ which is designed specifically to support the body during sleep.